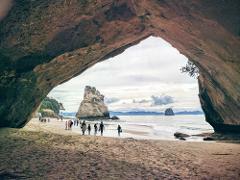 This unique day trip to the Coromandel Peninsula will take you to Te Whanganui-A-Hei (Cathedral Cove) Marine Reserve, Hot Water Beach, and the summit of Mt. Paku before returning to Auckland by minibus. Explore the most spectacular volcanic features of Rotorua with this flexible full-day tour from Auckland. Choose from either Waimangu Volcanic Valley, or Wai-O-Tapu Thermal Wonderland and one other activity before returning to Auckland.